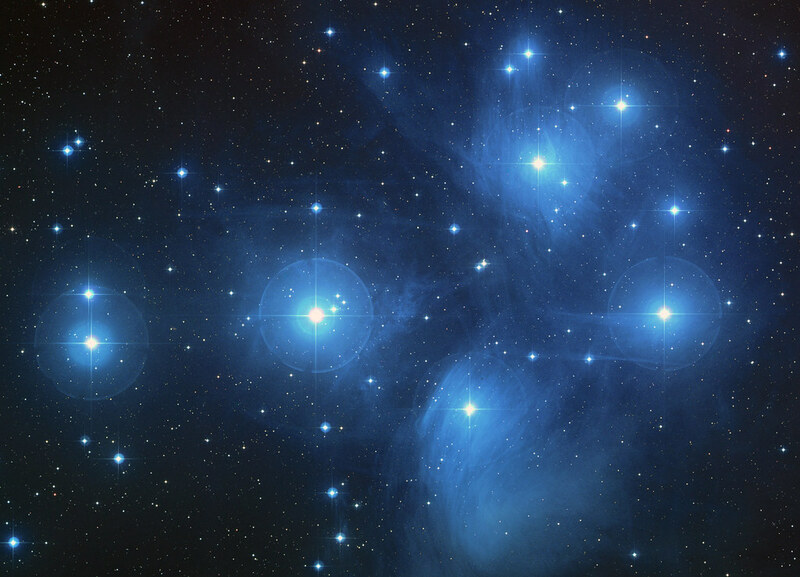 Tis the season to draw stars – many different kinds of stars. The classic star drawn by elementary-schoolers is a 5-pointed star created in a single stroke, leaving a pentagon in the center. Other hand-drawn classics include: a “Star of David”-style star: two overlapping triangles; a simple starburst of three or more overlapping lines; and a “Christmas” star: four overlapping lines with a longer tail. The spikes on a star in a telescope’s photograph are an artifact from the telescope itself. (An artifact is something in a photograph that looks real, but isn’t actually there). Most large telescopes have lenses or mirrors inside that are between the main opening of the telescope and the main mirror or lens. These smaller bits have to be held up in the middle of the telescope tube somehow. The easiest way? Struts. Support rods. These small struts then deflect the light from the stars, and cause spikes to show up on the image. Diffraction spikes show up on point-sources of light (like stars) because the light is coming from one location, not many. You can use this technique to identify stars in a photograph, and differentiate them from nebulae and galaxies. Mostly. I took a shot of the eclipse through my canon camera and got an image with a 14 pointed star just as the sun reemerged from behind the moon. Is this a result of diffraction? Why 14 points? Yes, that’ll be the aperture, it probably has 14 pieces. Scroll about a third of the way down for details! It’s cool.